kids 10 and under in a costume. With adult entree. 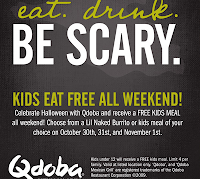 FREE Kids Meal this Halloween Weekend at Qdoba.